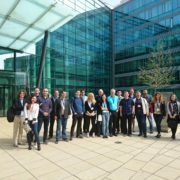 Within the framework of Eurostat’s European Statistical Training Programme (ESTP), DevStat in corsotium with the Lithuanian Department of Statistics and the National Statistical Institute of Bulgaria held a three day course on “The Use of R in Official Statistics” in Vienna on 5, 6 and 7 of April 2016. On this occasion, for the organisation of the course, DevStat was supported by Statistics Austria. The course was taught by part of their staff, Mr Alexander Kowarik (course leader), Mr Matthias Templ and Mr Bernhard Meindl and it was attended by sixteen participants from several National Statistical Institutes within the European Statistical System (ESS) and from Eurostat. The objective of the course was to provide participants with basic knowledge about the syntax and basis of the R programming language and to provide an overview of the main packages which are important for the statistical production process. The activity will pay special attention to these packages devoted to management of large databases and the analysis of complex surveys. The content of the course covered the following topics: essentials of R; descriptive statisitics; data visualisation; programming with R and R in a statistical office.